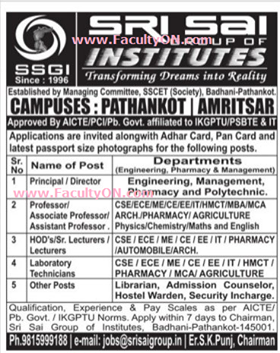 Sri Sai Group of Institutes, Amritsar has advertised in Tribune newspaper for the recruitment of Associate Professor/Assistant Professor/Professor jobs vacancies. Interested and eligible job aspirants are requested to apply within 7 days. Check out further more details below. About College: Sai Institute of Engineering & Technology, Manawala, Amritsar was established in Year 2008 with intake of 60 seats each in B.Tech programmes of Computer Science & Engineering, Information Technology, Electronics & Communication Engineering & Mechanical Engineering. In the subsequent year intake was increased, B.Tech in Civil Engineering, M.Tech in Computer Science and Engineering (1st shift and 2nd shift), Civil Engineering and Mechanical Engineering were started.